MOOG Servo Valves 72 Series - Heash Technique B.V.
MOOG 72 Series flow control servo valves are throttle valves for 3 and preferably 4-way applications. they are a high performance, 2-stage design that covers the range of rated flows from 95 to 225 l/min (25 to 60 gpm) at 35 bar (500 psi) valve pressure drop per spool land. MOOG 72 series valves are suitable for electro-hydraulic position, speed, pressure or force control systems with high dynamic response requirements. The 72 Series is ideally suited for applications in the 95 to 225 l/min (25 to 60 gpm) when superior dynamics are a must. The 72 Series Flow Control Servo Valve consists of a polarized electrical torque motor and two stages of hydraulic power amplification. The motor armature extends into the air gaps of the magnetic flux circuit and is supported in this position by a flexure tube. The flexure tube acts as a seal between the electromagnetic and hydraulic sections of the valve. The flapper of the first stage hydraulic amplifier is rigidly attached to the midpoint of the armature. The flapper extends through the flexure tube and passes between 2 nozzles, creating two variable orifices between the nozzle tips and the flapper. The pressure controlled by the flapper and nozzle variable orifice is fed to the end areas of the second stage spool.The second stage is a conventional four-way spool design in which output ﬂow from the valve, at a fixed valve pressure drop, is proportional to spool displacement from the null position. A cantilevered feedback spring is fixed to the flapper and engages a slot at the center of the spool. Displacement of the spool defects the feedback sprint which creates a force on the armature/flapper assembly. Input signals induce a magnetic charge in the armature and cause a deflection of the armature and flapper. This assembly pivots about the flexure tube and increases the size of one nozzle orifice and decreases the size of the other. The differential pressure created by this action causes spool motion. The resulting spool displacement induces a linear force in the feedback wire which opposes the original input signal torque. Spool movement continues until the feedback wire force equals the input signal force. 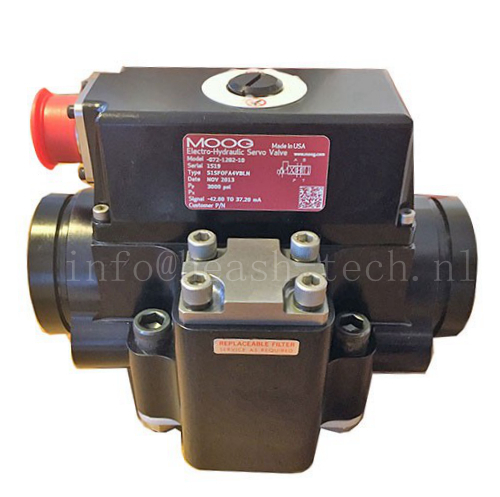 HEASH TECH supply Moog 72 series valves, which are suitable for electrohydraulic position, speed, pressure or force control systems with high dynamic response requirements. Most of them are used in Metallurgy, Automobile manufacturing, Power plant, Testing machines, Petroleum industries. HEASH TECH supply MOOG Valve 072 series as MOOG 072-1202-10, 072-1203-9, 072-559A, 072-560A, MOD-072-1202-10, 72-1202-19, 72-1203-85, 072-155A, 072-1101-6, 072-1203-34, 072-1701, 072-1102-6, 072-1301-81, 072-103B, 072-101A, 072-102A. Hydraulic fluid Hydraulic oil per DIN 51524 parts 1 to 3 and ISO 11158.